Brenda Donohue is well known for her work with RTÉ television and radio over the past 25 years. 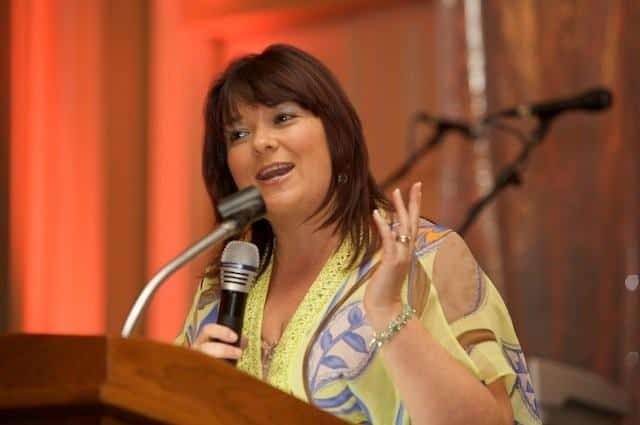 Brenda started out on the Gerry Ryan Show on 2FM and became a household name and Ireland’s number one roving reporter during her time on the show. Brenda’s sense of fun and warmth continues to engage the Irish public and has gone from strength to strength across several shows on RTE Radio One including her own show Like Family and on others such as The Marty Squad, Countrywide and The Mooney Show. Brenda has presented many of her own shows on Radio 1 including Like Family which is currently airing along with The B Side, The Health Show, Café Live and Going Home. Brenda has also presented a series of one off documentaries on well-known Irish personalities which include Mary Byrne and Irish soccer player, Stephen Hunt, amongst others. Brenda has also presented a number of TV shows including The Selection Box, Get Flirting and The House of Love and is a regular contributor to The Afternoon Show on RTÉ 1. Brenda has made a number of appearances on Irish TV chat shows including The Late Late Show. She also appeared in Celebrity Bainisteoir as the Bainisteoir for Kilcullen in 2012. Brenda lives in Johnstown in Co Kildare and is married with three children. Brenda recently featured as one of the leaders on Celebrity Operation Transformation and has also presented a number of TV shows including The Selection Box, Get Flirting and The House of Love and is a regular contributor to The Today Show on RTÉ1. Brenda has made a number of appearances on Irish TV chat shows including The Late Late Show. She has also appeared on Celebrity Bainisteoir for Kilcullen in 2012. Brenda lives in Johnstown Co Kildare and is married with three children. Brenda has a great mixture of life experience, both on and off-air, which she regularly shares with listeners and at events. She is a true professional with extensive experience and a passion for emceeing events.